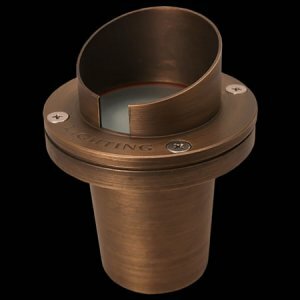 Designed to provide in-ground lighting solutions, the Nova is ideal for up-lighting a variety of elements, from trees and shrubs to pillars and other vertical structures. The die cast brass shroud is a standard accessory designed to minimize glare while the designer lenses allow maximum design control by creating various beam spreads and light output. Precision machined. Includes angled shroud and flat shroud with captivated stainless steel screws. Accepts up to one additional lens/hex cell accessory. Shock resistant glass lens.Comes with frosted dome lens and complete set of optical designer lenses including: spread lens, frosted, hex cell. For use with a halogen lamp up to 20W MR16 lamp. FLEX™ Series LED lamps are available in 3W or 4W MR16. LED lamps are available in 2700K and 3000K color temperatures. A remote 12V or 24V transformer required, may be ordered separately from Unique Lighting Systems®. Voltage range for 12V halogen lamps is 10.8V to 12V. Voltage range for 24V halogen lamps is 21.6V to 24V. Voltage range for FLEX™ Series LED MR16 lamps is 10V-18V. PBT sleeve for in-ground installation.